Wings of Cyrnellus fraternus redrawn from Schmid (1980, fig. 180) . Wings of Hagenella canadensis redrawn from Schmid (1980, fig. 555) . Wings of Rhyacophila acropedes redrawn from Schmid (1980, fig. 3) . 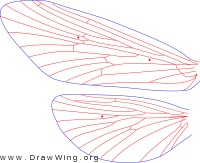 Wings of Theliopsyche grisea redrawn from Schmid (1980, fig. 544) . 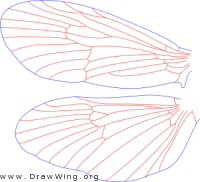 Wings of Arctopsyche ladogensis redrawn from Schmid (1980, fig. 114) . 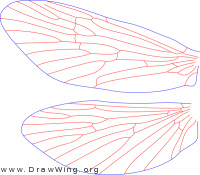 Wings of Ecclisomyia conspersa redrawn from Schmid (1980, fig. 266) . Wings of Heteroplectron californicum redrawn from Schmid (1980, fig. 730) . Wings of Ceraclea annulicornis redrawn from Schmid (1980, fig. 661) . Wings of Platycentropus radiatus redrawn from Schmid (1980, fig. 411) . Wings of Homophylax andax redrawn from Schmid (1980, fig. 495) .